Posted on September 4, 2014, 3:27 pm, by Google Webmaster Central, under advanced, performance. Posted on May 19, 2014, 4:00 pm, by Google Webmaster Central, under advanced, beginner, intermediate, mobile, performance. To help developers and webmasters make their pages mobile-friendly, we recently updated PageSpeed Insights with additional recommendations on mobile usability. Poor usability can diminish the benefits of a fast page load. We know the average mobile page takes more than 7 seconds to load, and by using the PageSpeed Insights tool and following its speed recommendations, you can make your page load much faster. But suppose your fast mobile site loads in just 2 seconds instead of 7 seconds. If mobile users still have to spend another 5 seconds once the page loads to pinch-zoom and scroll the screen before they can start reading the text and interacting with the page, then that site isn’t really fast to use after all. 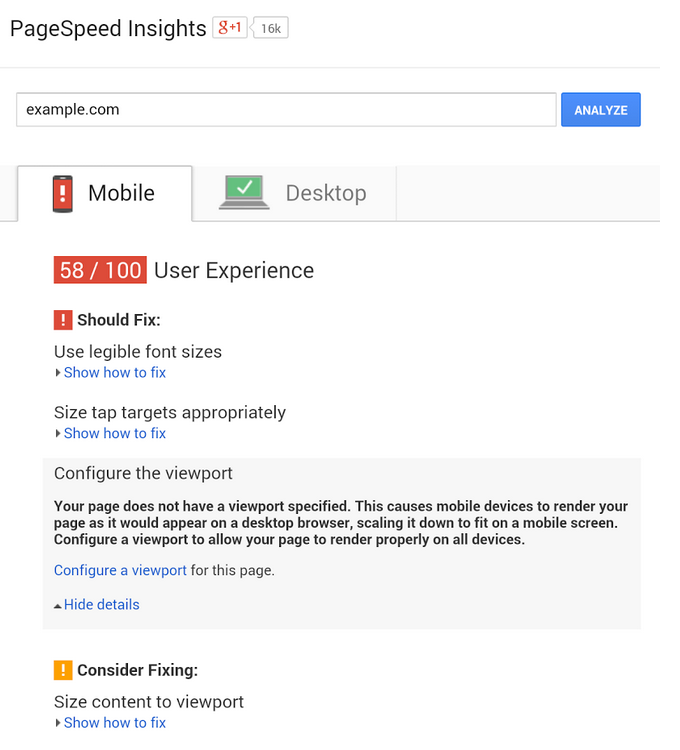 PageSpeed Insights’ new User Experience rules can help you find and fix these usability issues. Configure the viewport: Without a meta-viewport tag, modern mobile browsers will assume your page is not mobile-friendly, and will fall back to a desktop viewport and possibly apply font-boosting, interfering with your intended page layout. Configuring the viewport to width=device-width should be your first step in mobilizing your site. Size content to the viewport: Users expect mobile sites to scroll vertically, not horizontally. Once you’ve configured your viewport, make sure your page content fits the width of that viewport, keeping in mind that not all mobile devices are the same width. Use legible font sizes: If users have to zoom in just to be able read your article text on their smartphone screen, then your site isn’t mobile-friendly. PageSpeed Insights checks that your site’s text is large enough for most users to read comfortably. Size tap targets appropriately: Nothing’s more frustrating than trying to tap a button or link on a phone or tablet touchscreen, and accidentally hitting the wrong one because your finger pad is much bigger than a desktop mouse cursor. Make sure that your mobile site’s touchscreen tap targets are large enough to press easily. Avoid plugins: Most smartphones don’t support Flash or other browser plugins, so make sure your mobile site doesn’t rely on plugins. These rules are described in more detail in our help pages. When you’re ready, you can test your pages and the improvements you make using the PageSpeed Insights tool. We’ve also updated PageSpeed Insights to use a mobile friendly design, and we’ve translated our documents into additional languages. As always, if you have any questions or feedback, please post in our discussion group. Posted on August 8, 2013, 9:24 pm, by John Mueller, under advanced, intermediate, mobile, performance. Users tell us they use smartphones to search online because it’s quick and convenient, but today’s average mobile page typically takes more than 7 seconds to load. Wouldn’t it be great if mobile pages loaded in under one second? Today we’re announcing new guidelines and an updated PageSpeed Insights tool to help webmasters optimize their mobile pages for best rendering performance. Research shows that users’ flow is interrupted if pages take longer than one second to load. To deliver the best experience and keep the visitor engaged, our guidelines focus on rendering some content, known as the above-the-fold content, to users in one second (or less!) while the rest of the page continues to load and render in the background. The above-the-fold HTML, CSS, and JS is known as the critical rendering path. Posted on October 10, 2012, 5:01 pm, by Gary Illyes, under advanced, general tips, performance. If your page is on the web, speed matters. For developers and webmasters, making your page faster shouldn’t be a hassle, which is why we introduced mod_pagespeed in 2010. Since then the development team has been working to improve the functionality, quality and performance of this open-source Apache module that automatically optimizes web pages and their resources. Now, after almost two years and eighteen releases, we are announcing that we are taking off the Beta label. We’re committed to working with the open-source community to continue evolving mod_pagespeed, including more, better and smarter optimizations and support for other web servers. Over 120,000 sites are already using mod_pagespeed to improve the performance of their web pages using the latest techniques and trends in optimization. The product is used worldwide by individual sites, and is also offered by hosting providers, such as DreamHost, Go Daddy and content delivery networks like EdgeCast. With the move out of beta we hope that even more sites will soon benefit from the web performance improvements offered through mod_pagespeed. mod_pagespeed is a key part of our goal to help make the web faster for everyone. Users prefer faster sites and we have seen that faster pages lead to higher user engagement, conversions, and retention. In fact, page speed is one of the signals in search ranking and ad quality scores. Besides evangelizing for speed, we offer tools and technologies to help measure, quantify, and improve performance, such as Site Speed Reports in Google Analytics, PageSpeed Insights, and PageSpeed Optimization products. In fact, both mod_pagespeed and PageSpeed Service are based on our open-source PageSpeed Optimization Libraries project, and are important ways in which we help websites take advantage of the latest performance best practices. To learn more about mod_pagespeed and how to incorporate it in your site, watch our recent Google Developers Live session or visit the mod_pagespeed product page.